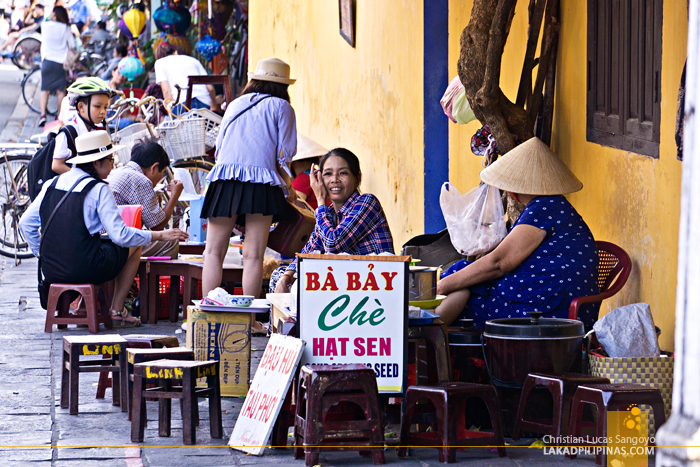 There are two things that the Ancient Town of Hoi An are proud of. The first is its inimitable history and heritage, the second is food. Lots of it. 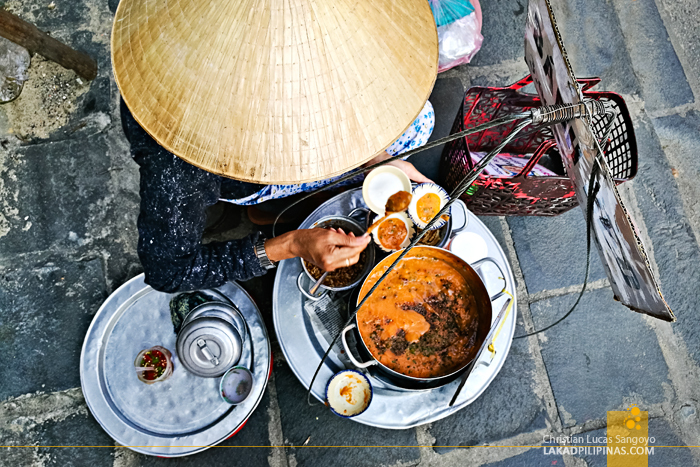 Hoi An, being a sort of melting pot after its history of being a trading post during the 16th century has amassed an arsenal of diverse food choices that can make your head spin, and your tummies, absolutely happy. 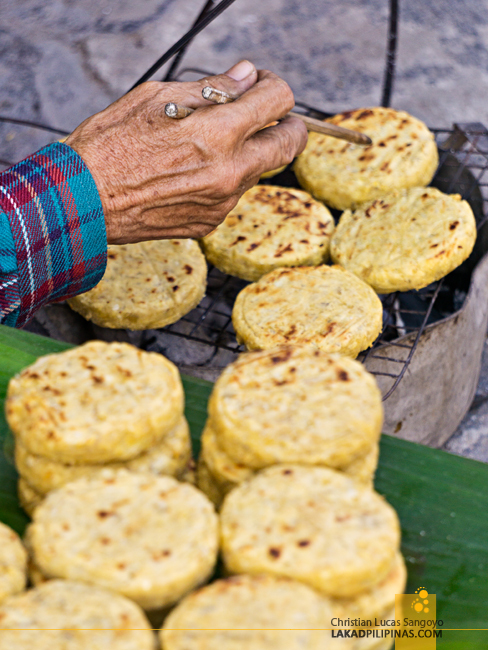 Hoi An is well known for three dishes, cao lau noodles, white rose dumplings, and banh xeo. But more than these, there are still a plethora of things you can eat while in town—be it on fancy riverside restaurants or street vendors from the sidewalk. During our three days in town, we saw a lot of chow that piqued our (tummies’) interest. A few of these, we were able to try, some we were contented on simply capturing on our cameras. If we only have unlimited funds (and tummy space), we would have tried them all. But as they say, it’s something to look forward to on our next visit. 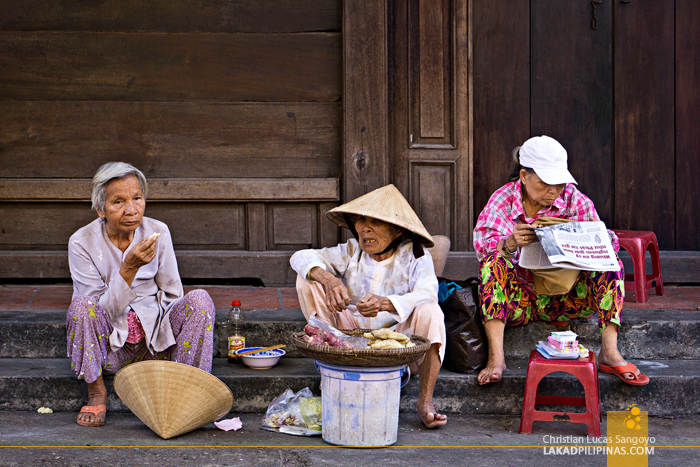 ► FOOD TOURS IN HOI AN? BOOK DISCOUNTED RATES ONLINE. 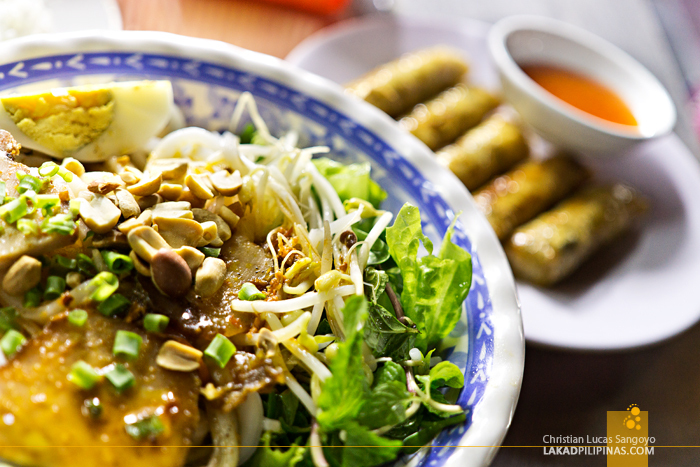 Cao lau is Hoi An’s signature dish. It’s basically rice flour noodles topped with sliced xa xiu or grilled pork and local greens like bean sprouts and torn lettuce or cilantro leaves. It’s a dry noodle dish, it has no soup. 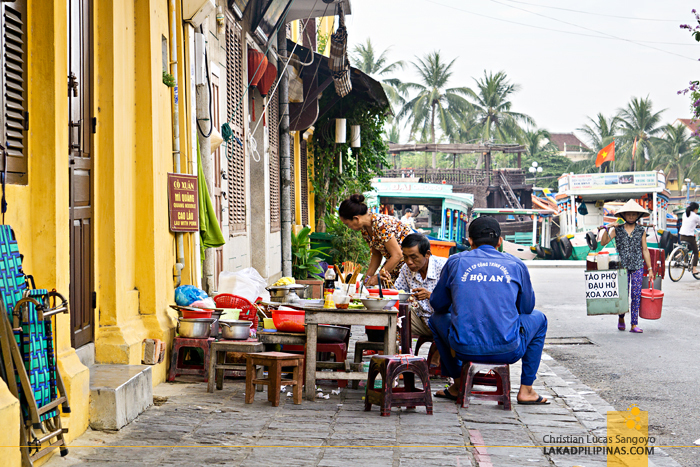 It is said that cao lau can only be found in Hoi An since its noodles are made using water from a special well within town. It may just be talk, but indeed, it is relatively true that one can only have this bowl of goodness here. And this is omnipresent wherever you go—from fancy restaurants to your humble mom and pop’s sidewalk hawkers. 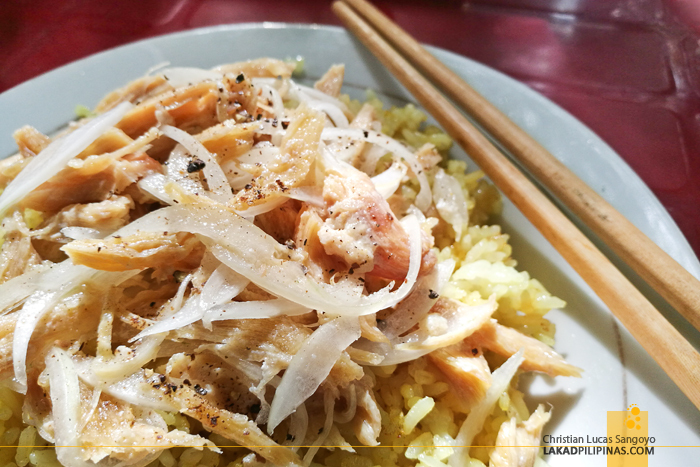 We sampled bowls of this during our trip and found the most tasty one at Café Phuong Vy [GPS MAP: 15.883260, 108.325157], an unassuming eatery along Hai Ba Trung Road. A bowl would generally cost you around VND35,000.00 (USD1.50 | PHP78.50). Vietnamese fried spring rolls are one of my absolute favorites in Vietnam. Down south, they call these cha gio, and here up north, nem ran. No matter the name, it’s all the same; lean minced pork, spices, and finely chopped veggies like carrots, wrapped into small rolls using plain rice paper, or sometimes, fancy textured net rice papers. I often say I could eat this all day. And we usually did. 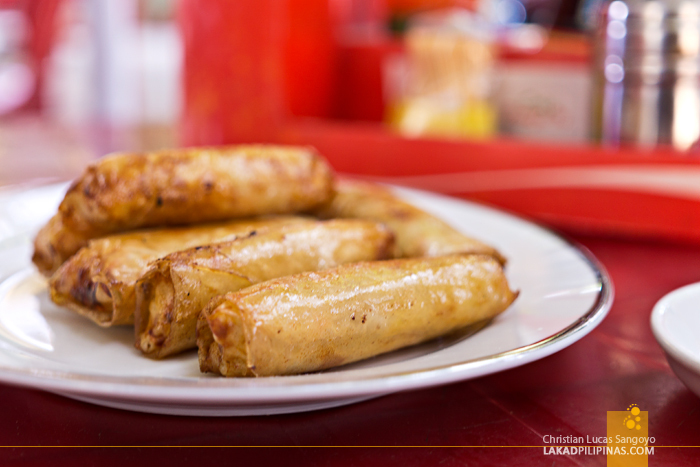 It’s a good pair for rice ala lumpiang shanghai, for noodles, and more importantly, it’s good enough by itself. This is usually sold in sets of six for VND40,000.00 (USD1.80 | PHP90.00) and can be found, not only in Hoi An, but anywhere in Vietnam. Point in fact, even Kiman Hotel, our lodging, serves it during its breakfast buffet. Banh tom was one of the really mouthwatering dishes we saw being peddled along the streets of Hoi An but were unable to try. Translated, it literally means, shrimp cake. This popular street food uses shrimps caught along the town’s Thu Bon River, flour from Cam Nam’s corn seeds, and a flourish of spices. Mixed together and quickly cooked in a pan of roiling cooking oil, it emerges with a crusty and crunchy texture. 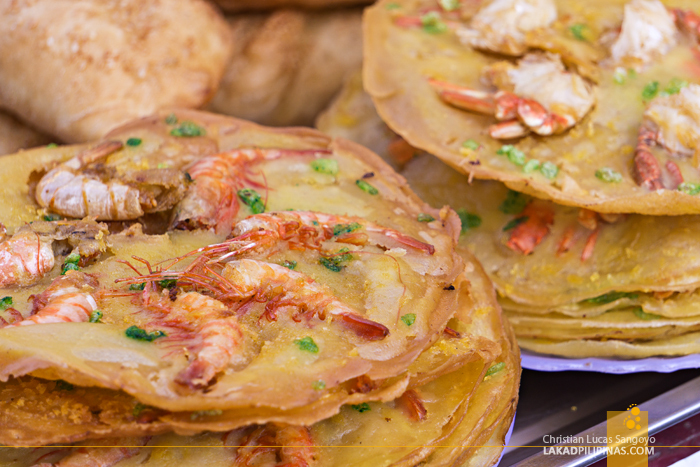 I often thought that this was called banh xeo, which also has shrimps but is more like a crepe. 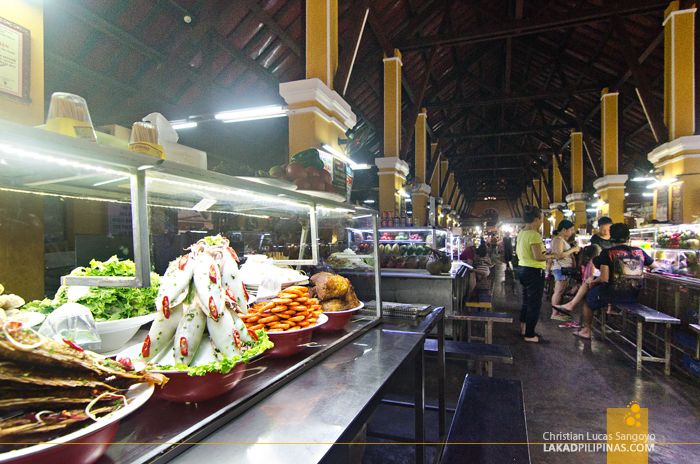 You’d often see this on stalls being sold along with fried doughnuts. A set usually sells for about VND20,000.00 (USD0.90 | PHP45.00). A snack we’re not really too keen on was the grilled sweet potato being hawked by a certain lady along the main avenue of Hoi An’s Old Town. It’s a round cake, shaped like a hockey puck, made up of boiled sweet potato, green beans, and coconut shavings. The whole thing is then grilled on a portable stove along with a few cobs of corn. It looks popular with the locals, but we’re really not into sweet stuff so we passed off on this one. It’s pretty cheap at VND5,000.00 (USD0.25 | PHP11.50) per piece. For something we did try, there’s com ga. In Vietnamese, com means rice and ga means chicken. So, it’s basically rice with chicken. The special thing about it is that the rice is cooked using the chicken broth and turmeric powder while the chicken is prepared in strips. A serving of marinated white onion strips and mint leaves seals the deal. We tried this on a couple of restaurant since my travel partner was always hankering for rice. It doesn’t look as appetizing as it looked, but it’s actually quite flavorful. A plate usually goes for VND40,000 (USD1.80 | PHP90.00) and it goes perfectly with my favorite nem ran. Mi quang literally means Quang Province noodle. You can find this all over Vietnam, but the best ones are, of course, from the Province of Quang Nam where Hoi An is located. Like cao lau, it’s dry and its noodles made from rice, but thicker and wider. 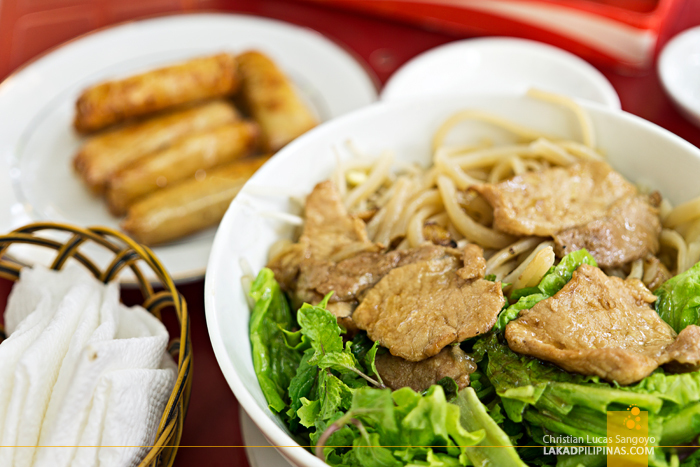 Toppings consists of roasted pork, shrimps, peanuts, sliced hard boiled eggs, bean sprouts, and greens like mint, basil and lettuce. It’s quite the symphony when it comes to ingredients and flavor. Banh beo was something we saw being peddled in Hoi An but didn’t understand at all. Served on a series of small plates in a series of spooned ingredients, our confusion on what it was was absolutely absolute. It seemed popular though, as there was queue of both locals and foreigners waiting to have their turn to buy a set. The dish, which literally means water fern cake, doesn’t really have ferns on it. It starts with a soft white rice cake at the bottom, then topped with shrimps, scallions, mung bean paste, fried shallots, and condiments like fish sauce, vinegar made from rice, and oil. It’s one complicated sweet and salty cake on a very small plate. I wish we just went for it and tried it. 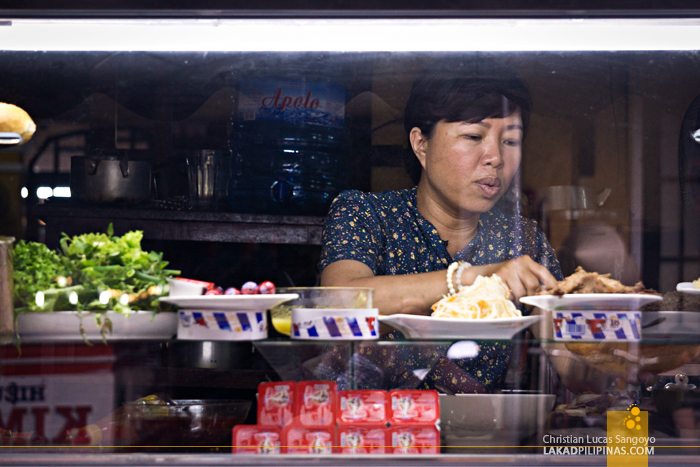 A plate would set you back around VND2,000.00 (USD0.10 | PHP5.00). 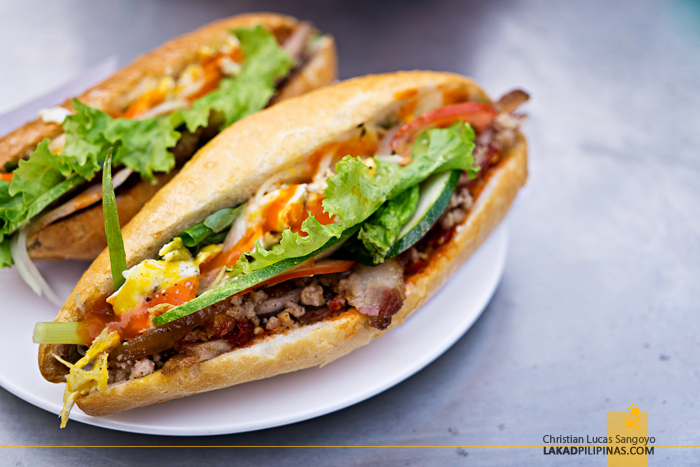 You’d think something as ubiquitous as a Vietnamese banh mi wouldn’t make it to this list, but when in Hoi An, you can’t ignore this sandwich. Tucked on one corner of the Centeral Market Food Hall is one of the most celebrated banh mi stall in the whole of Vietnam—Banh Mi Phuong or Phuong’s Bread [GPS MAP: 15.877239, 108.331405]. The stall got its nod from none other than the Kitchen Confidential chef, Anthony Bourdain. We actually searched high and low for this place after reading about it. It was easy, but at the same time, hard to find—we actually saw the stall right away at the left side of the Central Market Food Hall, but due to conflicting directions on the interweb we strayed some blocks away. After roaming around the area and comparing Bourdain’s video to that of Banh Mi Phuong, we finally settled down and ordered our banh mi. At VND25,000.00 (USD1.10 | PHP56.00) we were actually surprised at how affordable the sandwiches are, given the shop’s celebrity status. Note that it’s not only Bourdain who praised this to high heavens, but also locals who frequent the place! Talk about legit. And indeed, after waiting, the banh mi was as good as it was promised—one of the best, if not the best in Vietnam.